A fragrant, humble, not-too-sweet cake that’s perfect with afternoon tea or a late morning cup of coffee. While Julia uses all-purpose flour, I used a little buckwheat flour as it’s earthy flavor compliments the citrus and almond meal so beautifully. 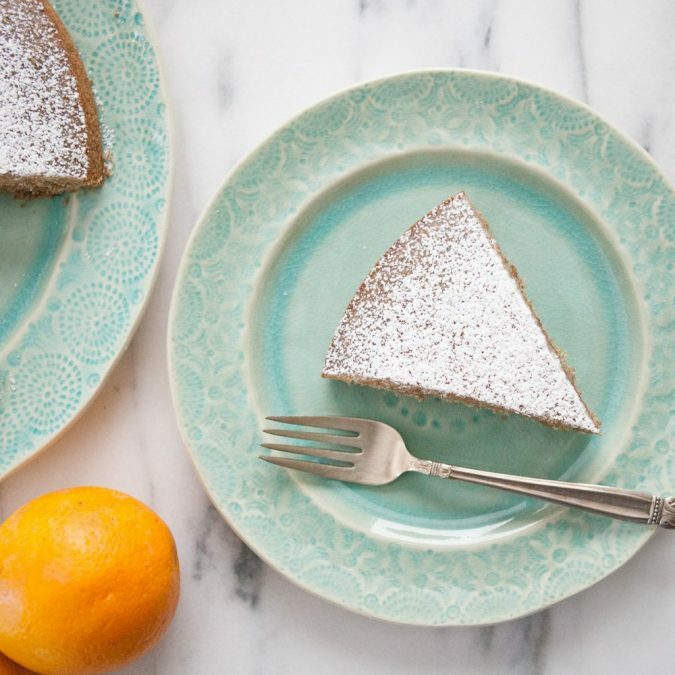 The color of the cake is a darker brown because of the buckwheat flour — if you use 100% all-purpose flour it will be more of a light golden brown. To make the cake nut-free, simply omit the ground nuts. Preheat the oven to 350 F. Butter the bottom and sides of an 8-inch cake pan, then line the bottom with a circle of parchment paper. For good measure, butter the parchment paper. Set aside. In a medium bowl, whisk together both flours, ground nuts, baking powder and salt. Bake until a toothpick inserted into the center comes out clean, about 25-30 minutes. Transfer the cake, still in its pan, to a wire rack and let it cool completely. Once cool, use a dinner knife to loosen the edges of the cake from the pan and invert it onto your work surface (you might need to give the pan a little whack). Peel off and discard the parchment. Invert the cake one more time onto a serving platter so the flat side is down and the domed side is up. Just before serving, dust the cake with powdered sugar. * Note: Julia notes that any nut works well in this cake: walnuts, almonds, hazelnuts, pistachios. Or purchase nut meal or nut flour at the store instead of grinding your own.